In June 2016 the European Central Bank (ECB) activated another programme intended to boost the Eurozone economy. In recent years large sums have been spent in an attempt to spur growth – so-called ‘quantitative easing’ – with cheap loans made available to banks, and the buying of sovereign bonds, among other measures. So far, banks have been the primary recipients. This time around, the ECB has taken it a step further and started buying corporate bonds – essentially, making cheap loans to corporations, which is fundamentally a kind of subsidy to some of the biggest players in the European marketplace. So who are the beneficiaries? Which corporations are enjoying the goodwill of the big bank? Only a few names have surfaced over the past months, as the ECB does not reveal the names of the companies, only the codes of the bonds. Now, Corporate Europe Observatory has looked them all up, and the picture that emerges is disturbing. 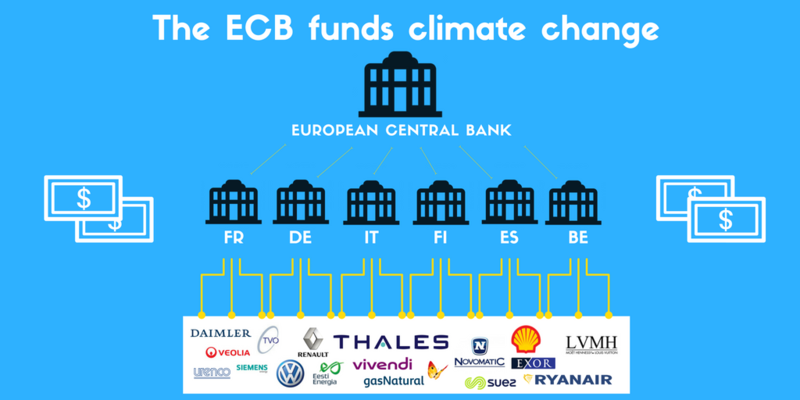 Notably, it seems the ECB in its own way is helping fuel climate change, providing financial support to both oil and gas companies, and car-makers, including, Shell, Repsol, Volkswagen, and BMW. The Corporate Securities Purchasing Programme (CSPP) was decided in March and took off in June. Since then, the ECB has spent €46 billion on corporate bonds (as of 25 November 2016).1 According to one estimate, it is set to reach €125 billion by September 2017.2 No small sum. Bonds are basically a form of loan. The buyer lends the issuer money, interest is paid at regular intervals, and face value is then paid back at a fixed date, the date of maturity. When bonds of a particular kind get popular on the market, corporations have to pay less interest. “It feels good to CSPP’d”, the Financial Times reported on 20 July 2016, citing research that showed how bonds actually bought by the ECB fared better than other bonds. To issue a bond is not straightforward, it requires expertise in financial markets. Many corporations have banks of their own that manage the complicated transactions. It is a world that is not accessible to SMEs, that would go to a bank for credit, not sell bonds. For that reason, the CSPP is a helping hand to big corporations, not to SMEs. The bonds are not bought directly by the ECB. The ECB coordinates the effort, but the actual buying takes place in a decentralized manner, with six central banks – the German, Spanish, Italian, Belgian, Finnish, and French – doing the work. They have all been assigned tasks to identify and buy attractive bonds in not just their own country, but in others as well, so the effect can be spread in a more or less even manner. 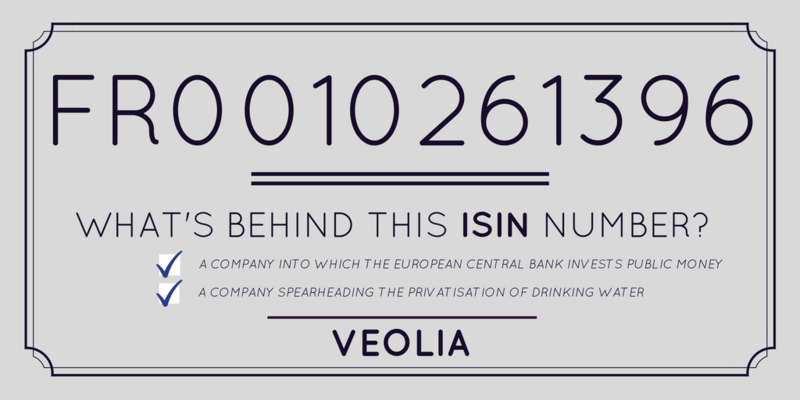 All six central banks regularly update information on their holdings on the ECB website.3 Unfortunately, except for Deutsche Bundesbank, they do not reveal the names of the companies, only the codes used to designate a particular bond, the so-called International Securities Identification Number (ISIN). But finding the names via the ISIN code is a simple job. Corporate Europe Observatory has looked them all up to see what investments the ECB has found worthy of public money. Unfortunately, a lack of transparency at the ECB means the amounts held in bonds of individual corporations are not revealed. While many pension funds do release this information, it seems that the common national bank for hundreds of millions of European citizens is unable to! Nevertheless, a lot can be learned from the lists. From the lists produced by Corporate Europe Observatory, it seems there is a consistent strategy in terms of sectors. High priority is given to infrastructure, including motorways, trains, and even airports. However, by no means is the programme simply focused on utilities. The bond purchases as a whole tell a story; the CSPP as it stands, is about climate change. There is a distinct smell of fossil fuels in the holdings list, with some of the biggest oil companies enjoying remarkable attention from Frankfurt. The ECB has bought no less than 11 times from Shell, 16 times from Italian oil company Eni, 6 times from Repsol, 6 times from Austrian OMV, and 7 times from Total. The clear number one sector, though, is electricity and gas utilities. When counting the purchase of bonds for example in Spain, 53 per cent are from companies involved in gas, and the corresponding number in Italy is an astounding 68 per cent. Though the amounts – the total the ECB holds in these companies – are not available, the high number of trades indicates a strong interest in companies that are contributing the most to climate change. The bias towards dirty energy companies is strong. Unless Siemens intends to invest in wind turbine production with the money received from the ECB, the only ‘alternative’ energy form present on the list is nuclear, with enriched uranium producer URENCO and Finnish nuclear power company Teollisuuden Voima on the list. The ECB bond purchases also show a strong preference for the car industry. This is most clearly seen in the list of purchases by the German Bundesbank. The most frequent investment by the ECB is tied between Daimler AG (producer of Mercedes) and BMW with 15 purchases apiece. Volkswagen bonds come in at 7, whereas French carmaker Renault is at 3. Finally, it must be assumed that the presence of the Agnelli family’s investment holding company Exor is to make sure Italian cars Fiat and Ferrari also feel the Christmas spirit. In addition, the three big private water corporations, Suèz, Vivendi, and Veolia have a strong showing on the French list of purchases. This might stir up angry sentiments among those who oppose the privatization of water, which has been spearheaded by these French companies. Other investments simply appear bizarre. Why, for instance, would public entities invest in and hence subsidize a gambling company like Novomatic, owned by billionaire Johan Graf and headquartered in Austria? And why should public funds flow into the coffers of producers of luxury goods, including LVMH, producer of Moët & Chandon champagne, Hennessy cognac, and classy Louis Vuitton women’s handbags, some of which carry price-tags in the thousands of euros? All this begs the question: how are the official ECB investments picked? There appear to be few criteria, and none of them are qualitative in nature. The corporation must be incorporated in the Eurozone, it cannot be a financial corporation (or a credit institution supervised by the ECB), it cannot be a public entity, and the bond in question to be backed up by a positive credit rating.9 Other than this, there are no official guidelines in the public domain. Instead, what is certain is that the large sums being spent are in effect a public subsidy for corporations making climate change worse, while in no discernible way helping ordinary people recover from the economic crisis that still stalks Europe. Has there been a large increase in companies issuing corporate bonds? Not only has it been buying these bonds (many of which are below investment grade) but it seems to have bought most of them on the secondary market. Therefore the biggest beneficiaries have not been the corporations but the bond owners. Got any bonds you want to offload? If you have connections at the ECB it should be no problem.